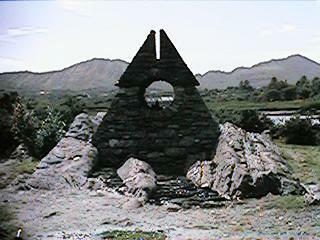 Sneem is a town on the ring of Kerry, between Kenmare and Caherdaniel. The photographs below are not of historic interest but they show an interesting connection bewteen Egypt and Sneem. 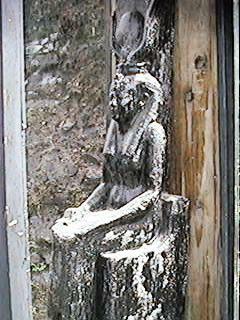 On the wall of the local parish church is a statue of Isis, an Egyptian God. It was a gift from the people of Egypt to the people of Ireland and was presented by the ambassador of Egypt, H.E. Hussein Mesharafa on the 10th July 1993. 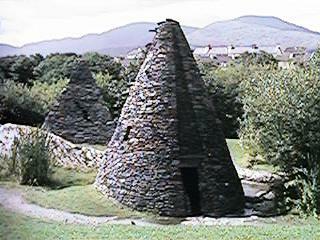 Also near the church is a sculpture garden containing pyramid like structures which are also like the beehive huts of former days.